Amazing Wilderness, Wild Life, Unique Cultures, & Spectacular Scenery! The greatest portion of the Himalayas is in India. There are vast areas of wilderness which have a great diversity of wildlife. These rugged mountains are also the home of some very unique people groups. In many ways Spiti is even more rugged and remote than Ladakh. There are several one day hikes that lead to beautiful lakes, scenic overlooks and interesting Buddhist Monasteries perched high on rocky crags. There are several places where you will find fossils above 14,000 ft! Highlights include treks to the viewpoint above Demol, the lake above Dunker and the lake above Kibber and tours of the Key, Dunkar and Tabo Monasteries. The Tabo Monastery is one of the oldest monasteries in the world and said to be a favorite of the Dali Lama. There are now roads from the valley floor up to almost every high village in the valley. There are also short cuts - the local trails to many of these villages that can be used to avoid walking only on the roads but trekking between some of the high villages is now on unpaved roads. For this reason day hikes/ treks to the various places of interest or walking from village to village and house stays are a viable option. 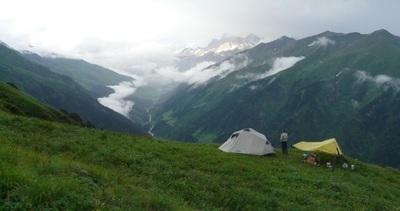 Still, if you prefer to camp in the scenic spots a full trek is in order! Trek Tsomoriri to Kibber - from Ladakh to Spiti One great option is to trek from Tsomoriri Lake in Ladakh to Kibber Village in Spiti and then leave by road! This trek takes you through remote wilderness. This is one of our favorite treks because of the beauty and the high chances of seeing wildlife. This 8 day trek takes you one whole day along the Tsomoriri Lake, crosses a glacier and the Parang La pass. The glacier is not technical but it is always a special experience to cross a glacier in the middle of summer. Another option is to tour Spiti and then trek over Baba Pass to Kinnaur. This is a 5 day trek. The Manali–Spiti–Kinnaur loop is one of Asia’s great road trips! It is an amazing trip for mountain bikers. Making the trip by motorcycle or in a vehicle with four wheels is also an amazing journey. It takes you over some of the most challenging roads in India. 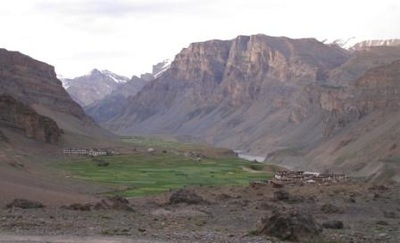 A century ago Rudyard Kipling in his novel "Kim" described Spiti as "a world within a world." The name "Spiti" means "The Middle Land", meaning the land between Tibet and India. It was historically part of Western Tibet. Spiti is a relatively unknown world, tucked away in the Trans-Himalayan belt of Himachal Pradesh. The Buddhist culture of the people is very similar to that found in the nearby Tibet Autonomous Region and the Ladakh region of India. The valley and surrounding region is one of the least populated regions in India. It is a high desert mountain valley with villages high up on the mountain sides. There are peaks reaching almost 6,000m and the average altitude of the valley floor is 3600 m! 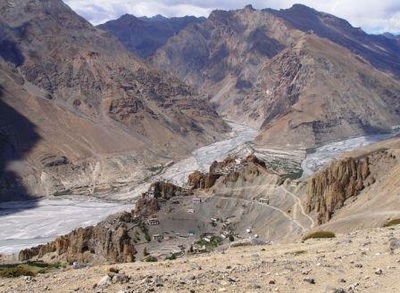 This unique geo-climatic cold desert region borders Tibet in the east and Ladakh in the north, Kinnaur to the south east, and the Kullu Valley to the south. Trekking in this region is at a lower altitude than that of Spiti, Ladakh and Zanskar but that does not compromise the beauty! Bara Bhangal Trek (Bara Bangal) - from Manali to Bir or Biling The trek over Kali Hani Pass to the remote village of Bara Bangal starts or ends in Manali. This 11 day trek takes you over a glacier and a pass with very impressive views to a remote village four days from the rest of civilization. Visiting the village is like going back in time. Then continue on for another four days crossing another glacier and pass enjoying the absolutely marvelous views which last all the way back to civilization! A shorter but beautiful trek starts from the village of Prini four kilometers from Manali crossing the Hampta Pass to and going to Chandra Tal Lake or, for a shorter trip, Chettru on the road to Spiti. From the town of Naggar you can cross the Chanderkhani Pass to trek to Malana. For a much more challenging trek you can cross the Pin Parvati Pass to the Pin Valley in Spiti. 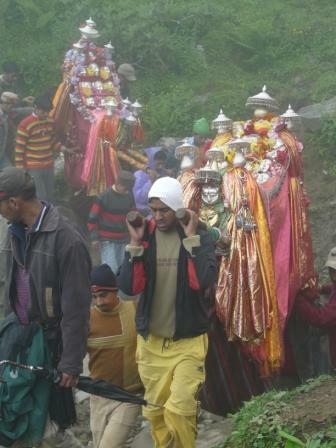 Another less strenuous option is to cross the Jalori Pass or Bashleo Pass to Shimla. During the spring through monsoon season there are literally carpets of wildflowers at the higher elevations. All of these treks take you through villages that still retain much of their cultural uniqueness. Manali is the main starting point for road trips to Ladakh, Zanskar and the Spiti and Lahool Valleys. It is also centrally located for the start of several treks. It is a great place for an acclimatization stop. The elevation is just under 2,000 m (7,000ft.) The town of Manali is surrounded by high peaks, with mountain adventures beckoning from all directions! If you stop in Manali to acclimatize or just take a break you can visit the hot water springs in the Vashisht Village or continue through the village and take a short hike up to the Jogini waterfall. The Naggar Castle twenty kilometers from Manali was the ancient seat of the kings of Kullu. The Naggar Castle now houses a small art gallery. You can also just meander through the villages and go back in time! The Kullu valley is known as the "Valley of the Gods" or "Dev Bhumi" was once known as Kulanthpitha, “The end of the habitable world”. The Kullu valley is sandwiched between the Pir Panjal Range of the Lower Himalayan and the Great Himalayan ranges. Kullu got its first motorable access only after Indian Independence. The area still has a very wide variety of unique cultures expressed in the dress, architecture and traditions of each people group. This is especially evident when you get out of the main towns and into the surrounding villages. The town of Manali was the beginning of an ancient trade route to Ladakh. The route continued over the Karakoram Pass all the way to Yarkland and Khotan in the Tarim Basin in China. Whatever your choice of transportation, foot, bicycle, motorcycle or by four wheels you can get a glimpse of life in a different century as you travel through mountains with majestic scenery and magnificent views!